Hey all, it's been a while. I've been back to the US and apologize for never finishing my posts on Asia and South America. I'll get to them someday. 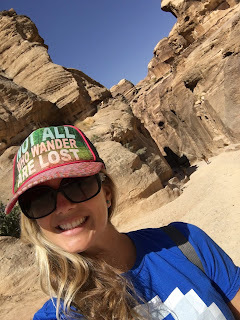 However, I'd love to share some of the gems from my most recent adventure with you... the Middle East! 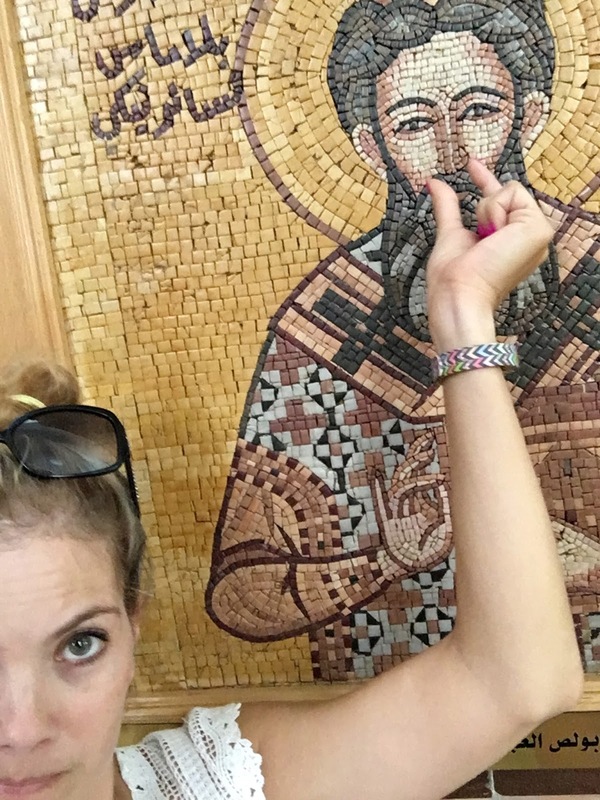 With all of the media framing and terrorist talk, I'm sure most Americans would think twice about visiting the holy land, but not me. So, on I went again...solo... for another adventure of a lifetime. As a gesture of peace, here are some of the amazing sights from my journey to JORDAN and ISRAEL. Hookah? The answer is always "YES"
The first awe-inspiring feature was The Treasury. It was glorious. I can't think of another word to describe it. Thousands of artists (Read: slaves) spent years carving this monument out of the side of a mountain. The details are spectacular and the size is astonishing. For those less agile or ambitious, there were camel rides available for $5 to take you to the Monastery. I was not witness to any angry or spitting camels. They were actually beautiful up close and didn't smell any worse than a petting zoo. The Monastery is absolutely incredible. It's gigantic! If you look at the photo below, those specs are FULL-SIZED HORSES so you can see the enormity of this beautiful tomb. How the heck did I manage to get a shot without people in it? Well, it was 118 degrees and a Wednesday. Ain't nobody silly enough to trek 4 miles through a canyon and up 800 stairs to see this bad boy. We did see a few other tourists taking donkeys up, but unfortunately some little girl fell off her donkey about 20 steps from the top and they turned back and never made it up. I feel sorry for them because it was stunning. I actually hiked the entire day, but having never been on a camel, I couldn't help but pay $5 for a photo and a pack of postcards. I logged over 20,000 steps, I earned the right to be cheesy. Beyond the Monastery, another half a mile up the mountain was an amazing view of valley below. I decided to give my brother a shout-out with my Detroit Lions Nintendo Techmo Bowl T-shirt atop the mountain with the Jordanian flag. 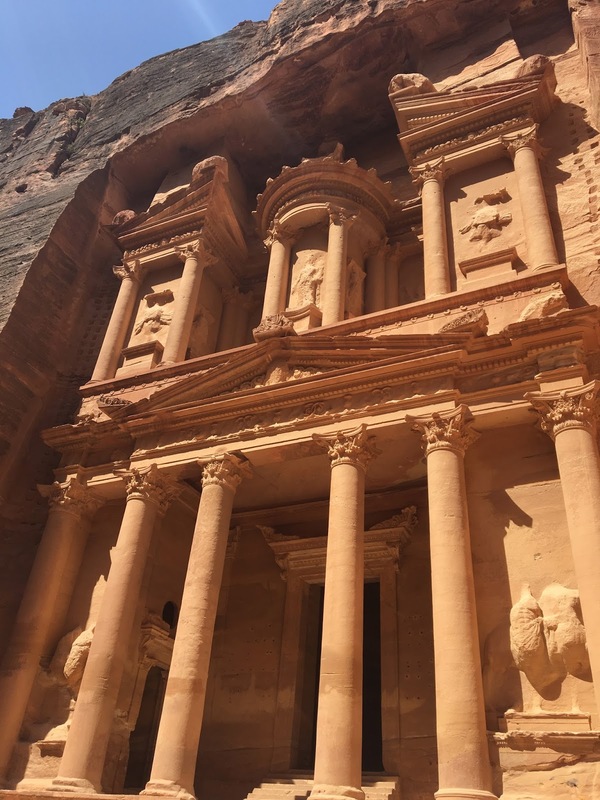 Petra was a long day, but there was plenty more in Jordan to see. 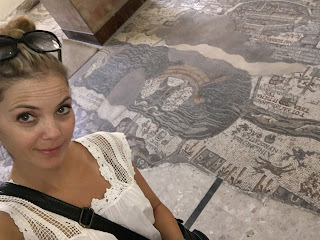 A short drive away from Petra headed north toward Amman is a small town called Madaba. The Greek Orthodox Church of St. George houses a mosaic map of the holy land (Jerusalem) from the 6th Century. Madaba loves their mosaics. The entire church was filled with them as were every chochki shop in town. Next up, Mt. Nebo. We headed to Mt. Nebo to check out Moses' view of the holy land. Look over the valley my friend, it's breath taking. Surprise! I got invited to take photos at a baptism in the River Jordan. Boom! I was super excited until I saw how nasty the water was. I still had to remain covered so thank goodness my hiking leggings looked good with my long sleeve dress. I could only bring myself to dip a toe in. I didn't contract any funk, so maybe I was even blessed by it? Back to Amman. What can I say about Amman? It's a giant congested city. There is nothing spectacular or beautiful about its sand colored buildings, un-policed streets and unruly driving habits. The food was phenomenal and made up for the stressful driving situations. There are no lanes in the road and people generally don't abide by any reason or laws other than drive forward. If there is a collision between a local and a foreigner, it is ALWAYS the foreigner's fault so make sure you have cash on hand to avoid potential issues. Also, there are a MILLION speed bumps on the highways and random checks for vehicles about every 30-50 miles. You can't go to Jordan without visiting the Dead Sea. In fact, aside from seeing my friends there, that was my top priority. YES YOU REALLY CAN FLOAT WITH NO HANDS OR FEET. The Dead Sea is awesome. It is over 383 feet below sea level and is almost 10x saltier than the ocean. It's so salty that nearly nothing can survive in it. With that being said, the salinity and high concentration of magnesium and other minerals create healing properties in its mud and water. So of course I went in and bathed in the mud. I had a major wipeout on my bike 2 days before leaving that left a gaping wound on my knee, ankle and skidded of an entire toenail. Nothing was going to stop me from going in the dead sea - extreme salinity or not - so I brought along this super rad cast cover and it worked like a charm! No salt bites for me.